From the past few months, Steam Family Sharing feature was in beta stages, but it’s all about to change. Valve announced the feature is now exiting beta, and is available for all the Steam users. If you don’t know what this feature does, it give users the ability to share their steam libraries with other users and computers, for example, you family, friends, etc. 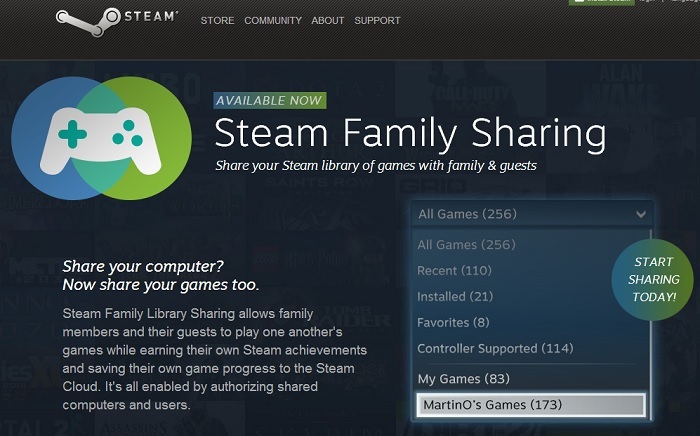 Steam’s Family Library Sharing is now released for all Steam users. Players who share computers can now also share their available libraries with one another, each earning their own achievements and saving their own game progress to the Steam Cloud. It’s all enabled by authorizing shared computers and the familiar accounts that log into them. The service can be enabled on five steam accounts sharing a single library or ten devices at a given time. Under this new program, each Steam members can get their own achievements, play games from other member’s library (the one he’s authorized to access), and the game data is saved in the Steam Cloud. It has taken the service few long months to come out of beta, but now that it has, it should come as a good news for Steam users who want to share or try games owned by one of their friends.